Emily returns to Nashville (for a few days, at least) to ponder life in Los Angeles and how one band - or even one album - can turn a place into a home. Mid-March, 2016. After what feels like centuries separating me from a distant life in Nashville, Tennessee, I find myself, of all places, in a real estate office on the Sunset Strip. The home of Whiskey A Go Go and the haunting remnants of LA’s antiquated punk-rock scene is now comprised of an Equinox, a string of first-class restaurants consistently crowded by their stiletto-clad patrons, and a monstrous inauthenticity. My desk is an addendum to the office kitchen, facing away from the action to one lone palm tree that sways mercilessly across a vacant parking lot, its brittle leaves offering a coquettish nod to the region’s superficiality – transplanted trees growing amid a heap of 1970’s concrete. Behind me, a cackle of broad-shouldered, suited up men walk to and from the coffee machine, mumbling incoherent real estate jargon beneath their breaths with the overstated urgency of Tom Hanks in Apollo 13. I left Nashville in pursuit of my intuitive whims, feeling certain that I would be more in my element drowning in the perfect blend of glitz and grime that underscores Los Angeles. And I am. But not without its perils. Successfully living in Los Angeles in your twenties comes with a hefty price – the complete acceptance of a person’s insanity to make such a choice. The only way to navigate a city that is – by nature – completely void of direction, is with a healthy dose of absurdity, coupled with a great album to play on repeat through bygone hours spent in traffic. Because this is Hollywood, and perhaps the only time in my life that I will allow myself to embrace the full extent of narcissism that I am humanly capable of exhibiting, I cloak my eyes into oblivion with brightening concealer, smear coral lipstick across my mouth, and curl my eyelashes to the heavens with clunky coats of the blackest of black mascara. I’ve even taken to keeping a straightener and a bottle of dry shampoo in my desk drawer. The palm tree winks. When I realize that, despite the unabashed advances of the previously aforementioned palm tree, I remain totally invisible to the team of alpha males who plot their monopoly of the Los Angeles real estate market, I decide to make a change. I buy a pair of Audio Technica headphones – the sort that can only attract the attention of males who wonder what alien planet I have descended from – and put on Lucius’ recent Good Grief release, the expectant follow-up record to their widely acclaimed 2014 Wildewoman. This kismet moment is when everything begins to change for me. Instead of talking to the palm tree, I now have the consistent companion of an album whose depths extend far beyond the synth pop arrangements and closely knit harmonies. And like any good friend, the album shifts gracefully between the restrained moments of introspection, and the wild cacophonies that usurp our conscious minds. It’s the soundtrack to my move from the tidy, sensible Nashville to the entropic and outdated world of LA. It gives order and meaning to what would otherwise be an endless string of Groundhog Days in the forever sunny and illusory world of which I am now willingly a part. Good Grief is a wondrous container of emotional outpour. While the direction of the album branches off to pay homage to a series of musical influences, from its heavy nineties-pop influences to a blend of gold-standard folk harmonies, the beauty of this record is within each meticulously arranged track. Each song paints an undeniably real, almost humorously adept perspective on the seasonal feelings that crop out of wildly embracing a journey with no end in sight. If you’re trying to understand the album from a strictly musical vantage point, you may find yourself overwhelmed by the streams of inspiration that make their way into each track. But if you take a deeper look into the arrangements, paying attention to the ways in which singers Jess Wolfe and Holly Laessig orchestrate emotion, it’s breathtaking in its catharsis. Perhaps this is why I love the record so much – Good Grief is Los Angeles. A bold and successful attempt to create order out of chaos. On tracks like “Madness” and “Gone Insane,” the two front women find their groove with pulled back harmonies trucking over the eerily restrained rhythms before exploding into unbridled exhibitions of heartbreak. These are the tracks that I blast unabashedly in my corner kitchen, where my internal melodramas have played out to peak point – and I begin to wonder whether Los Angeles has truly made me lose my mind. “Almost Makes Me Wish For Rain” is the perfect synonym for the paranoid sentiment of jinxing yourself with too much joy – a lovely companion to those few and far between moments when the captain of the real estate team meets my eyes and smiles. Meanwhile, “What We Have To Do (To Change)” is a soulful surrender to a connection that feels beautiful in the moment, but doesn’t seem to fit in a grander puzzle – the epitome of my bohemian existence clumsily trying to fit into the convention of West Hollywood dogma. Each track on Good Grief puts the microscope to the perspectives and attitudes we all secretly hold about relationships, the emotional bridges we cross in trying to tie one part of our lives to a future and unforeseen destination. 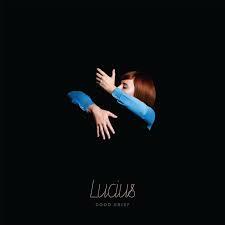 In the final track, “Dusty Trails,” Lucius creates the perfect conclusion to the tumultuous journey taken throughout the album’s previous ten tracks. “If we skipped ahead to a pre-fulfilled dreams we’d be lost without our own advice,” Wolfe and Laessig sing – a sentiment that offers all the comfort necessary to keep trucking along a shadowy but golden road. Much of the inspiration for Good Grief came from the praise the band received when playing live. It’s not a coincidence that I found this album to be the perfect soundtrack for my own life stage – the songs are as animated and awake as the live performances that have gained them so much esteem. Which is exactly why you should go see them this Wednesday at the Cannery Ballroom – a wonderful alternative to the CMAs. And plus, I’ve flown back across the country to attend the show. Come share a whiskey with me, and I’ll tell you some more stories about life on the strip.